Dee Lee Promotions, LLC in Association with Rising Star Promotions along with Nick Tiberi, Matchmaker. present “A Night of Live Boxing” at The Hockessin PAL Center located at 7259 Lancaster Pike, Hockessin, DE 19707. Dee Lee brought the first state, Delaware, it’s first ever Championship fight 19 years ago and she decided to bring them another championship fight. 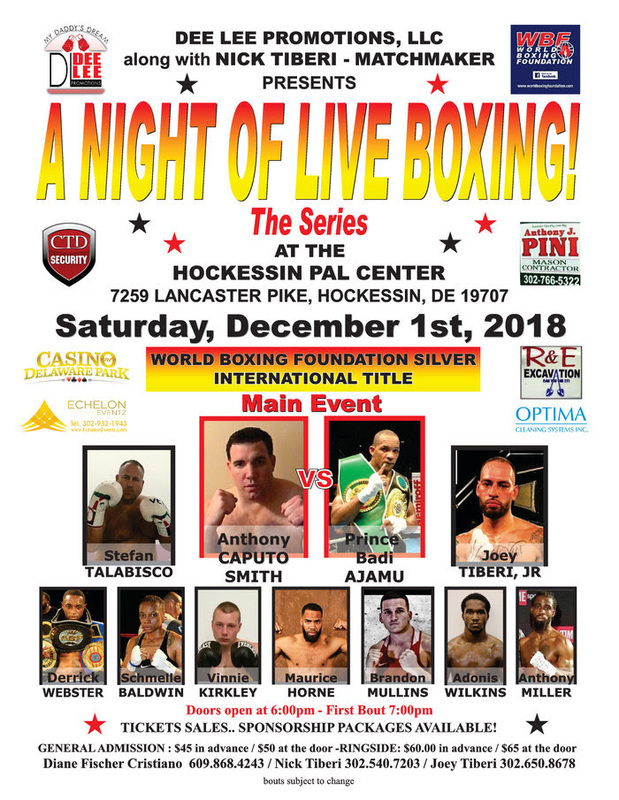 This time, Anthony “The Bull” Caputo Smith (16-8-0/11 ko’s) and Prince Badi “The Boxing Prince” Ajamu (29-5-1/15 ko’s) face off for the World Boxing Foundation Silver Cruiserweight title. In a 8 round Special Attraction, Glassboro, New Jersey’s Super Middleweight Derrick “Take it to the Bank” Webster (28-1/14ko) takes on Accra, Ghana’s Joshua Okine (29-7-1/17ko), aiming to take another step towards a World Title opportunity. The Co-Main on this terrific fight card features the return of fan favorite Stefan “The Freak” Talabisco (1-0-0/1 ko) of Elsmere, DE. The local heavyweight is sure to help pack the house and when he steps into the ring the crowd will be ROCKIN’! The undercard is jam packed with a young hungry crew of Delaware fighters led by “Joltin” Joey Tiberi (16-3-0/9 ko’s), Schmelle “The Real Deal” Baldwin (2-0-0/1 ko’s) of Newark. fresh off his impressive knockout pro debut Vinny Kirkley (1-0-0/1ko) of New Castle, Maurice “The War Time” Horne (3-0-0/ 2 ko’s) of Middletown. Brandon Mullins (2-0-0 /1 ko) of Newark. Lightweight Adonis Wilkins (Pro Debut), and middleweight Anthony Miller (3-2-0/3 ko’s) both Delaware natives. Come out and support these young fighters! Doors open at 6:00 p.m., with the first bout slated for 7:00 p.m. Tickets prices are; General Admission $45 in advance ($50 at the door), Ringside $60 in advance ($65 at the door) For more info contact: Promoter Diane Fischer 609.868.4243, Matchmaker Nick Tiberi 302.540.7203 or Joey Tiberi 302.650.8678.